A Dear Evan Hansen Movie Is Waving Into DevelopmentAnybody have a script? 16-Year-Old High Schooler and Jimmy Awards Winner to Star in Dear Evan HansenMeet Jimmy Awards star Andrew Barth Feldman. Ben Platt and Lin-Manuel Miranda Mashed Up Hamilton and Dear Evan HansenProceeds from “Found/Tonight” go to the March for Our Lives. Dear Evan Hansen’s Ben Platt to Star in Film That Will Probably Also Have CryingPlatt’s starring in Love & Oatmeal as a writer caring for his mentally ill sister. Broadway’s New Evan Hansen Gets Back to His ‘Sad Boy’ RootsTaylor Trensch talks about leaving Hello, Dolly!, being friends with Beanie Feldstein, and the advice he got from Bette Midler. Beyoncé Finally Saw Dear Evan Hansen After Ben Platt ‘Conjured’ HerBen Platt begged her on Twitter. The Hamilton Cast Recording Has Officially Sold More Than Rent’sHamilton now moves into sixth place on the all-time list for Broadway’s best-selling cast albums. Noah Galvin and Taylor Trensch Will Replace Ben Platt in Dear Evan HansenGalvin will perform from November 21 until Trensch starts performances mid-January. Tony Winner Ben Platt Will Leave Dear Evan Hansen This NovemberThe show has not yet announced a replacement. Backstage Portraits From the 2017 Tony AwardsBen Platt, John Legend, and more. 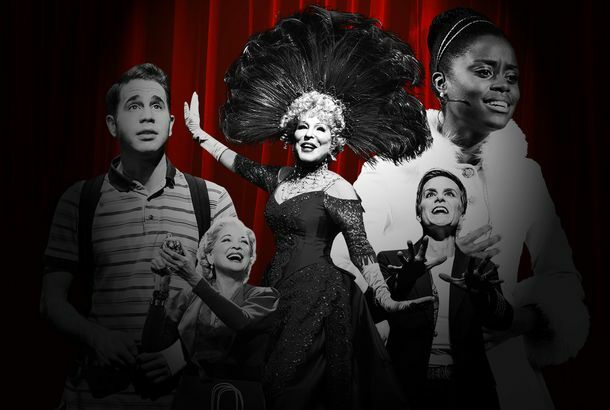 The 9 Best Broadway Songs of the SeasonThe season’s standout tunes, featuring a lying teenager, several heroic Canadians, and a lot of drunken, angsty Russians. Please Enjoy Miscast Takes on Dear Evan Hansen and DreamgirlsThis year’s Miscast videos are here. This Cast Recording Just Debuted Higher on the Charts Than HamiltonThough it falls below Hamilton in number of albums sold. Theater Review: Dear Evan Hansen Moves UptownNot much change to an already remarkable musical.